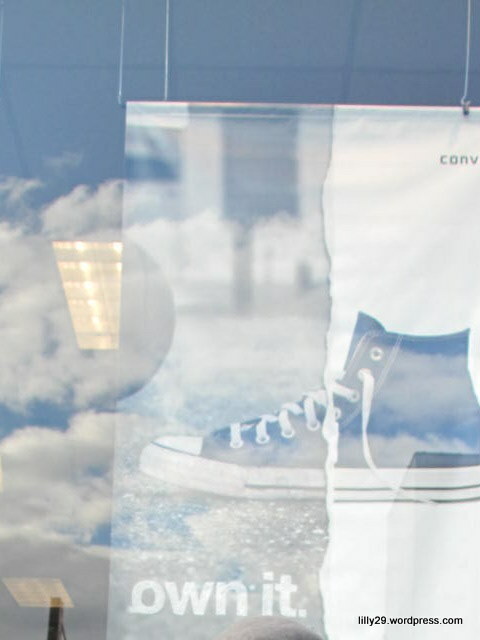 There are two pairs of Converse, 5 hats, and two sneakers in this photo, Can you see both of them? When kids get bored, just play I Spy. That is a game that will and can go on forever! Okay, a few days ago I blogged about a park in my neighborhood that is always locked. No, I didn’t call the city like I said I was. Just to busy. However, I did notice another park in my neighborhood. It was open to the public and now there is a wired fence all around it…do you think they are going to shut it down and build? I hope they don’t because we need that park. It is not fair to the people who do love nature. We have enough stores and some store mangers are struggling to pay the rent while other mangers are walking away leaving an empty building. Why build something in the green space we have? 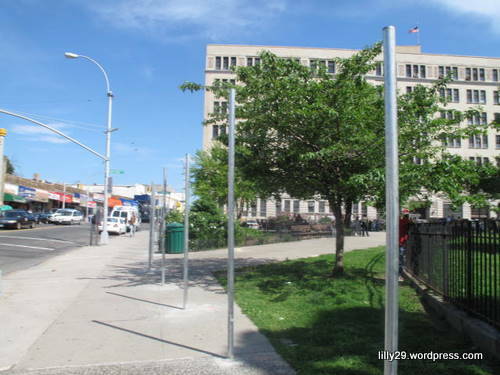 This is a picture of the poles I notice before the fence was put up. 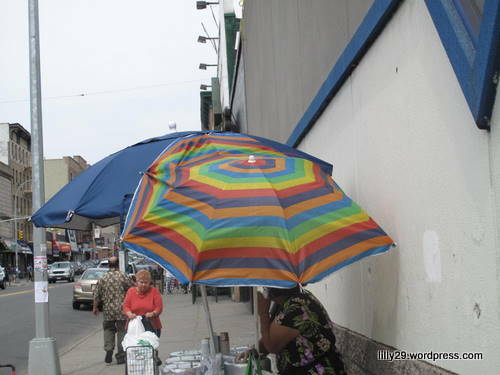 I was rushing past an icy stand- a lady selling ices on the sidewalk- and I notice really quickly that the big beach umbrella that she had covering her looked like a wide brim hat. Even though I was rushing, I went back to take a quick snap. 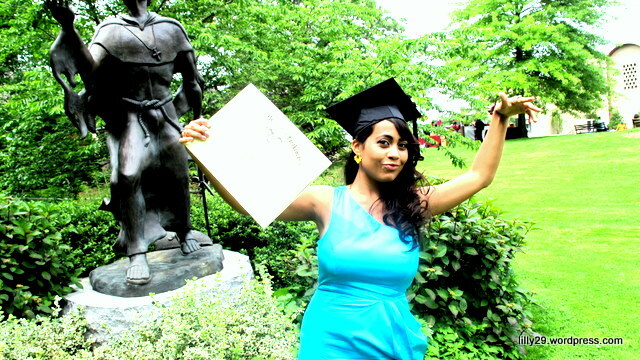 This past weekend, a handful of my friends graduated from my alma mater, Fordham University. I had no idea that graduations were the events to attend for good Fashion photography . I cannot forget the images I saw on Saturday! I mean the hats, the do’s and the don’ts, the tacky wacky to the fashionistas and of course I won’t forget the men and the suits, shirts, ties, bow ties…I felt I was at a fashion show. It was amazing and just camera time. But I couldn’t stop and snap. I had to be there for my friends. Thank God one of them is a fashion diva herself and made graduating so much ‘funner’! I set through a ceremony which I am glad I did because the speeches were very motivational. (The president of Ireland was the speaker…the fact that it is a lady president is what made the graduation even more special). Two things that stuck with me was something that one of the student speakers said: remain teachable and set the tone for your own story. Which is what my dear friend is doing with her style. She is setting her own dressing tone. Notice her bold color and her ability to wear it and feel good about standing out. Also, the hair pulled to one side of the head is a style not to many can pull of without looking childish but she does it well. 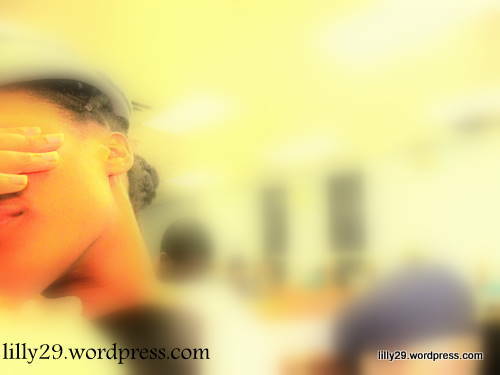 She had on yellow shoes and yellow ear rings to match but I like this photo the best. Her confidence is something one can see. And it makes you smile and think about graduating. Yesterday I met three of my student’s parents for the first time. I have been tutoring, mentoring, counseling, encouraging, even feeding (once in a while) these children since I have started going to the library; yesterday was the first day I met their father. And he did not even know who I was. He also looked really, really young. Like he could have been their older brother but that is beside the point. I was very happy to finally meet someone. And they were happy too because they told me to go introduce myself. Which is something I do to most of the parents I meet. I have to tell you, since I have been working at the library, I have met a parent of every kind but in most of them I can almost feel their power of their desire to see their children do very well. And I love that. With that power I know I am around the right kind of people. If the children are feeling beat or discourage, I would meet a parent who will have that fire for his or her child. That energy is positive and good. I tell you, if you are a parent and you have a child who loves the library, you are a blessed parent. 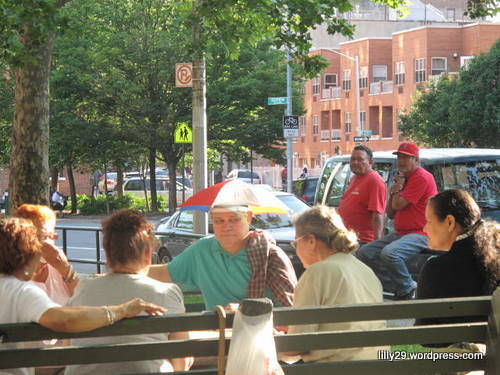 The sun is beaming down but he’s keeping cool with his very serious Umbrella Hat. A lot of my older students are getting reading for graduation. They found out what middle schools they will be attending and are pretty excited. I can’t believe I stayed with them for a year! It went by so fast! And, I am already meeting new children. 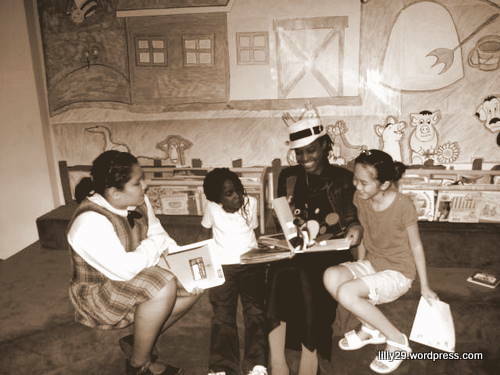 I met two little boys – very enthusiastic fellows (Jose and John) and their older sister Laura. But that is not really what I want to talk about, even though it is on my mind. I want to talk about something else. 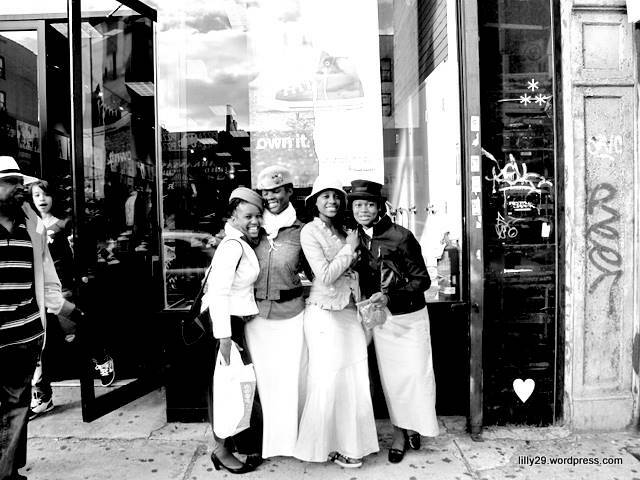 The lyrics to popular songs that are sung by our children -day in and day out- everyday. I wonder if children songs even exist anymore. 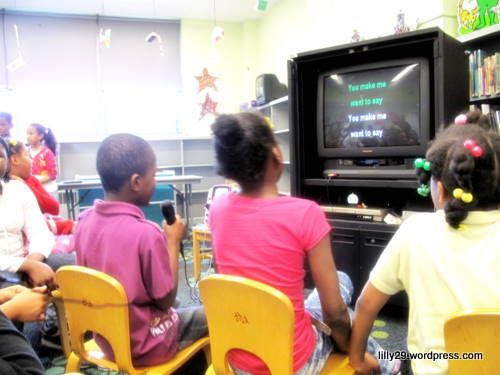 Recently there has been Karaoke at the library almost every week and this give the kids a chance to sing together. It also give me an idea of the children preference in music… and the songs are very sexual and inappropriate for children but for some reason society let them sing the songs. The songs they were singing along to, I didn’t know any of them, mainly because Beyonce and Young Jeezy are not people who I would want to listen too. I don’t mind children singing love songs but the songs these artist sing – are they really love songs? Is ‘ All the Single Ladies’ a love song. There was one song that got really graphic and I begin to feel very uncomfortable with the children singing along. I gave the librarian an eye and she went on the next song. But it still bothered me that they knew the words! A moment of silence for the innocence that is slipping away from our youth. So, apparently when the camera first came out- everyone wanted a picture of themselves. One didn’t feel scared to raise his camera and record what was going on. These days with the rise of technology and everyone having a camera, no one really wants their picture taken. What is the future of the photographer? Is there a way the photographer can freely record what is going on now?